Antique Log Cabin on 10+ acres just a few miles to Lexington Kentucky. The luxurious logs used to give this entire property massive integrity to this architect-designed cabin were reclaimed from a circa 1800 house and barn. This portion of the cabin offers full-length hand hewn log walls, 18 foot stone fireplace and second floor master suite overlooking the fireplace. 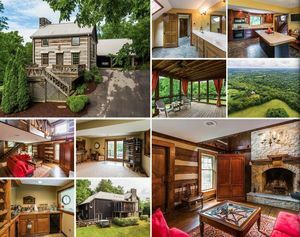 Antique Log Cabin on 10+ acres – minutes to downtown Lexington, Kentucky, woods, basement.